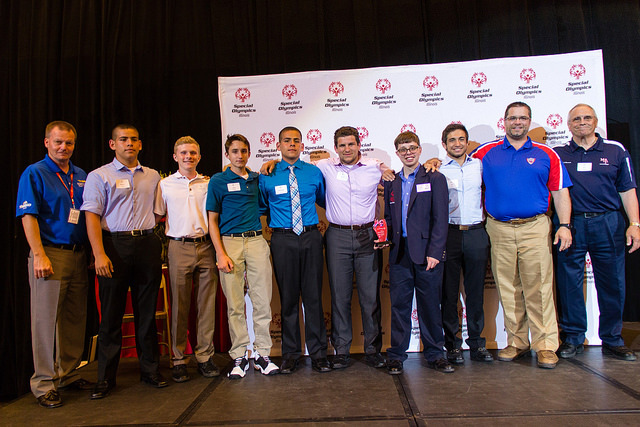 Marmion Academy is one of the first event host locations for Special Olympics Illinois Far West Suburban Area 2. Marmion hosted the Area track and field meet from 1974-1976, and also hosted the first aquatics meets. After a short break in participation, teacher Bill Johnson began having students volunteer with Special Olympics. For more than 15 years, the all-male private school has provided volunteers for the Area 2 Winter Games, bocce, Spring Games, bowling, golf, 2015 Holiday Party and a local Motor Activities Training Day. Marmion has also been kind enough to open up Marmion to host the July Tennis Tournament for the past two years. 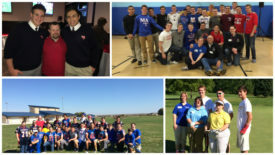 Marmion always come with men who are focused, responsible, reliable and are willing to do whatever is asked of them. They are an outstanding group of men who routinely get comments and compliments from coaches, parents and other volunteers. This school year, Cadet Camps with Special Olympics was created and Marmion Academy has opened up its facilities and coaching to the athletes. In addition, the Marmion football team has worked out with local Special Olympics athletes and the track team has also volunteered to work with the athletes.